Bryzgalov led the Coyotes this week posting 3 wins with solid numbers. Bryz has been playing much better of late and has bounced back from injury and illness to play at the top of his game. Look for Bryz to continue to put impressive stats, however his win contribution will be dependent on a Coyotes offence. Honourable mention to Kari Lethonen and Tim Thomas who both went 2-0 and had decent goalie stats. Visnovsky is currently riding a 5 game point streak in which he has 1 goal and 8 assists. The offensive output from Visnovsky should be surprising, he's currently on pace for a 67 point season, which would match his career high set in 05-06 with the LA Kings. Quarterbacking the Ducks powerplay is paying off for Visnovsky, as he is one of the top powerplay point leaders for defencemen who actually has a + rating. Honourable mention to Dennis Seidenberg (1G, 4A) and Kris Letang (1G, 3A). Bergeron has 9 points in last 4 games and led all forwards in scoring for the week. It's great to see him back scoring, but we wonder if he'll ever be back putting 70+ points like he did when he was a sophomore. 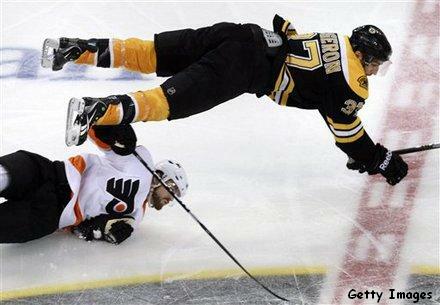 Nonetheless, it's great to see Bergeron back helping the Bruins and putting pucks in the net after a nasty concussion. Honourable mention to Jussi Jokinen (4G, 3A) and Steven Stamkos (2G, 2A, 16PIM). In the West, I am going to go with Anze Kopitar. The Kings have 4 games this week against DAL, STL, and back to back games against PHO. Kopitar has 46 pts in 44 games this year. In the East, look for Steven Stamkos to pass Sidney Crosby in points this week. The Lightning have 4 games this week against CBJ, ATL, FLA and ATL and Crosby has no timetable for return. Going to go with Keith Yandle in the West, he has been a great fantasy d-man this year racking up 35 pts in 45 games. The Yotes also have 4 games this week. In the East, I am going to take Tobias Enstrom over big Byfuglien. The Thrashers have 4 games against FLA, TB, NYR and TB. In the West, for the first time this season I am going to go with Jon Quick. Stats don't lie and 19 Wins in 33 games sounds pretty good to me. In the East, it's not a very tough choice here. Timmy Thomas and the Bruins have 4 games this week against CAR, CAR, BUF and COL.
Henrik Sedin and Alex Ovechkin both only registered 1 point each in 4 games played. Sedin killed me this week.